Kendall Jenner’s consumer-driven message of unity has, perhaps ironically, stirred up a good amount of dissent on its own. 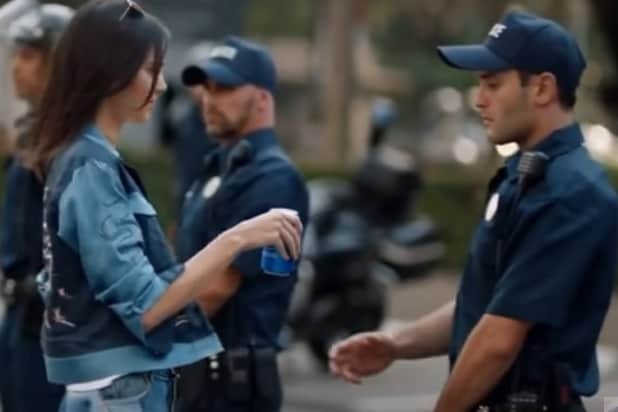 Jenner’s new protest-themed Pepsi ad was shredded to bits on social media Tuesday, by critics who believed that Jenner and Pepsi were appropriating protest culture to shill soda. But responses to the ad were anything but peaceful. At least if Jenner ends up eating crow, she’ll have a nice, refreshing beverage to wash it down with. So we should just give Putin & Assad & Trump a can of Pepsi & everything will be fine? Two nouns that should never be used in conjunction with the resistance movement. PepsiCo cares about your millennial social activism. That’s why we’re introducing *checks clipboard* Kendall Jenner high-fiving cops. What I love most about Kendall Jenner’s Pepsi commercial was the fact a writer, director, producer, & marketing department all cleared it.